Going Bald at 23: Why? Should I Shave My Head If I Am Going Bald? If you are afraid of going bald at 23, you are not alone. It is not uncommon to see men lose hair fast at a young age. Hair loss in men usually starts above the temples and the top of the head, but the back of the head is often least affected. Unfortunately, some men lose all of their hair by the time they are 30. Although you may have thick hair during your teens, going bald at 20 is possible. It may cause you to panic as many young men do, and lead you to think of ways to remedy the situation. Here’s some information on why you may be going bald at 23 and what you can do about it. Looking around, you will see a good number of men are facing a problem of early hair loss. Hair loss is not a serious health problem, but when it occurs at a young age, it may severely affect how you feel about yourself. Why are you going bald at 23? Here are some possible reasons. Stress is part of our everyday life, but with too much stress, it can become a cause of numerous health problems. Hair experts cite stress as a potential trigger for hair loss problems, which cause balding. The good news is that hair loss caused by stress is temporary and can be improved by practicing stress management. A poor diet may not explain why you are going bald at 20, but if your diet is lacking the essential nutrients that support healthy hair growth, severe hair loss may occur. Eating a balanced diet ensures a proper supply of proteins, vitamins and minerals for your hair follicles. A healthy diet also helps suppress the production of hormones such as dihydrotestosterone (DHT), which plays a major role in male pattern baldness. Hair loss can be inherited, and genetic factors may cause an increase in DHT, a by- product of testosterone, which influences hair loss. 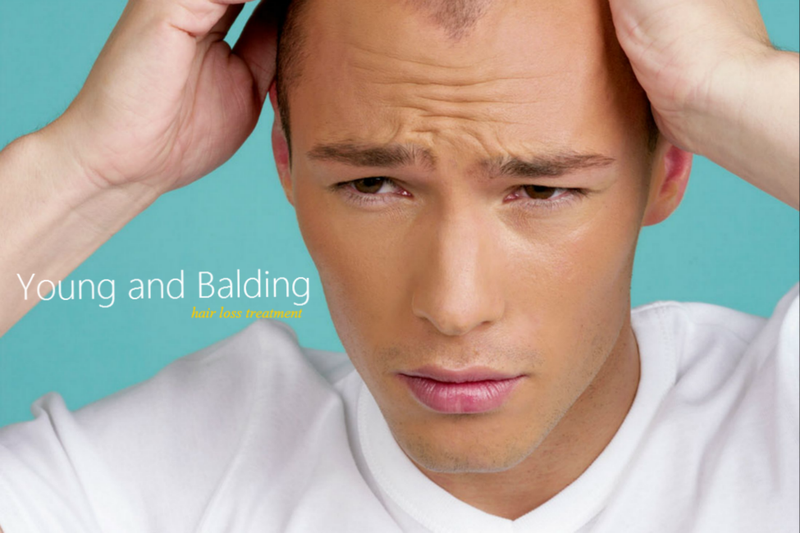 Male-pattern baldness is a hereditary condition that is characterized by a particular pattern of progressive hair loss. Hair thinning may begin in puberty and may be related to hormonal changes. However, hormonal imbalances can also trigger transient hair loss in women during pregnancy, childbirth, and menopause. Smoking increases your likelihood of going bald at 23. Your hair needs oxygen-rich blood in the scalp. However, smoking reduces the oxygen levels in the blood and increases carbon monoxide levels, which damages your hair follicles. Nicotine from cigarettes also reduces blood flow and negatively affects growth of hair. Shampooing too often, having perms, dyeing and bleaching hair may contribute to hair thinning because these can damage the hair, making them brittle and weak. Other practices such as using tight braids, rollers, hot curlers, and hair picks can also damage your hair. Although these procedures do not cause baldness, severe hair damage can cause lasting bald patches. Medical conditions that are accompanied by hair loss include thyroid gland disorders, fungal infection of the scalp (ringworm), polycystic ovary syndrome, and alopecia areata. Other factors that can increase your risk of losing hair at an early age include certain drugs (chemotherapy drugs, blood thinners, blood pressure medications, birth control pills), X-rays, burns, and injuries. Your shampoo, conditioner, hair spray and other hair products may contain harsh chemicals that can harm your scalp and hair, speeding up hair damage and loss. Choose hair products that contain natural ingredients and those that do not contain sulfates, alcohol, or silicone. Brushing tends to pull hair, especially when it is wet. Use a wide-tooth comb, instead, starting near the ends of your hair to comb out the tangles first, then working your way up to the roots. Avoid using heat styling tools such as straightening irons, curling irons, or other types of hot tools. If you really have to use these, choose the lowest setting whenever you can. Use nutritional oils such as egg oil or coconut oil or jojoba oil to massage your scalp. This can help increase blood circulation and stimulate hair growth. You can also massage the scalp while you are in the shower. Using a circular motion with the tips of your fingers, start near the forehead, going to the sides and then the back of your head, focusing on the areas where there is thinning of the hair. Lower your stress levels by getting more sleep, exercising frequently, and practicing meditation. Omega-3 fatty acids promote new hair growth. Include omega-3 rich foods such as avocados, walnuts, salmon and sardines in your diet. This B vitamin is found in animal-based food products like liver and meat. You can also take biotin supplements, which are believed to promote hair growth. Note: Consult your doctor if you experience sudden hair loss, patchy hair loss or severe hair loss to rule out any underlying medical condition that may require treatment. Some men would rather have a completely bald head than one that shows uneven hair thickness or patchy bald spots. In fact, baldness may project an image of manliness and strength. Although you may feel less attractive when you are going bald at 23, others may actually consider baldness more attractive than having a full head of hair. Some studies show that many people consider baldness as a sign of masculinity, dominance, and strong leadership potential. Shaving the head completely is not for everyone who is going bald. Some men may appear less attractive and older with a shaved head. However, many feel better about themselves after shaving off all their hair because it makes them feel less self-conscious and it gives them a new sense of confidence. Another advantage is that it takes off all the stress of trying to reverse hair loss and reduces their expenses. Whatever your choice, remember that your appearance alone does not define who you are. Server responsed at: 04/25/2019 4:28 a.m.